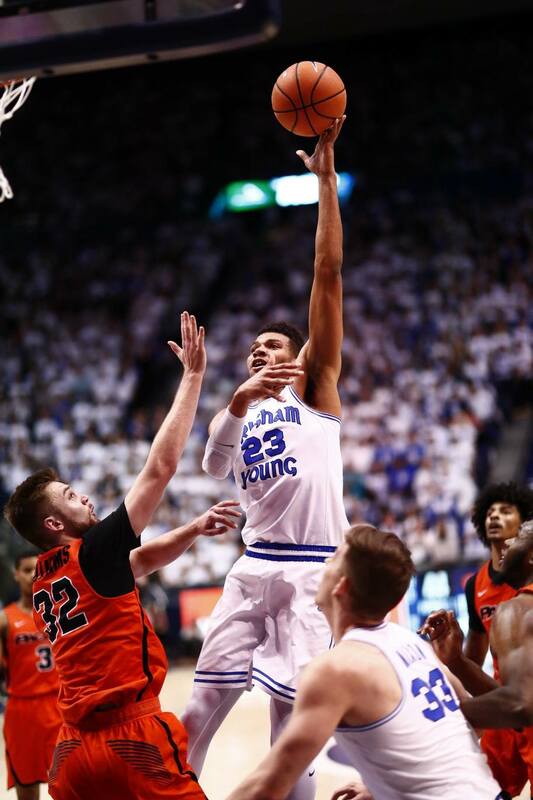 PROVO – Yoeli Childs has been battling the flu all week. Saturday, his performance left the Pacific Tigers feeling a little sick. Childs and Elijah Bryant combined for 54 points in BYU’s 80-65 win over Pacific Saturday night at the Marriott Center. Childs poured in 20 of his 26 points in the second half as the Cougars gained late momentum. Bryant missed just one shot (8 of 9) en route to 28 points. Rose said his team was a little out of sorts early in the game, considering the absence of Childs in the starting lineup. Childs credited BYU’s defense with being the key in the win, especially in the second half. The Cougars improved to 18-5, 7-3 (West Coast Conference) and snapped a two-game losing streak against Pacific (10-13 5-5), going back to last year. The teams traded blows and BYU trailed 11-10 heading into the game’s first timeout four minutes in. Pacific took over the next five minutes and led 20-12 before Payton Dastrup hit a 3-pointer and Bryant completed a three-point play on the next possession. Childs’ putback with six minutes left in the half tied the game at 24-24. A minute later, Childs threw down an alley-oop with one hand to put the Cougars up 26-25. Pacific hit a 3 in the final minute and led 33-30 at halftime. Bryant had a team-best 12 points. The Tigers got off to a strong start in the second half, but BYU clawed back and tied the score at 38-38 with a highly-contested Bryant lay-in. After another Pacific run, Bryant buried a 3 to make it 44-44 with 13:34 on the clock. Dalton Nixon completed a three-point play to put the Cougars up 47-44. A couple of possessions later, Childs scored to make it a 13-2 run and 52-46 lead for BYU. Childs swished two free throws and made it a 65-59 Cougar lead with just over three minutes left to play. He threw down a dunk while being fouled the next time down the court. Once again, he was good from the line for a 68-59 lead. After a Tiger flagrant foul, TJ Haws made both free throws for BYU’s biggest lead of the game up to that point at 70-59. The Cougars cruised from there for the 15-point win. The Cougars play next at LMU on Thursday at 8 p.m. PST. The game will be televised on AT&T SportsNet Rocky Mountain and a radio broadcast will be available at BYU Radio (Sirius XM 143) and KSL (1160 AM and 102.7 FM). Elijah Bryant recorded 28 points, shooting 8 of 9 from the field and the free throw line, as well as 100 percent (4 of 4) from beyond the arc. He also grabbed seven rebounds, four assists, one steal and one block. This was the ninth game this season he has scored over 20 points. He has scored at least one 3-pointer in 23-straight games, the third-longest single season streak in BYU history. Yoeli Childs added 26 points and grabbed six rebounds off the bench for BYU. He scored a single half career-high 20 points in the second half. This was the 21st-straight game Childs has scored in double-figures. TJ Haws contributed eight points, including four free-throws down the stretch. He also led the team with seven assists. Jahshire Hardnett tied his career-high eight rebounds while adding five points and four assists. As a team, the Cougars improved their shooting percentage from 45.8 percent in the first half to 75.0 percent in the second half, shooting 15 of 20 from the field. That is the best second-half shooting percentage this season. Defensively, BYU held Pacific to 47.3 percent shooting on the game while grabbing 23 defensive rebounds.